Crunchy hamster treat stick sized for the smallest of furry friends. Crunchy, long-lasting baked treat stick made with real apple & honey. Crunchy hamster treat made with fruits, grains, and honey for a tasty, healthy reward. Crunchy guinea pig treat made with fruits, grains, and extra Vitamin C for a tasty, healthy reward. 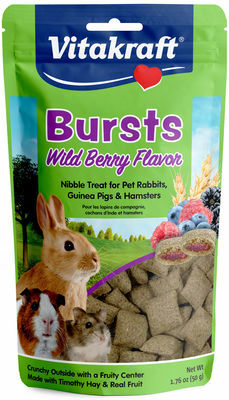 Crunchy rabbit treat made with fruits, grains, and fortified vitamins for a tasty, healthy reward. Crunchy, long-lasting baked treat stick made with real apricot & peach. Crunchy, long-lasting baked treat stick made with real honey, wholesome grass seeds, and eucalyptus leaves. Triple-baked parakeet treat made with real fruit, veggies, and wholesome grains. Crunchy, long-lasting baked treat stick made with real wholesome grass seeds, kiwi, and honey. Crunch Stick treat variety pack for pet rabbits & guinea pigs.